Despite having hit the ground running two years ago with its sensational Pursuit touring hybrid and been a highly rated participant in the latest Camper Trailer of the Year contest, BRS is still a 'haven’t heard of them' to many camper trailer people. This small time four-man operation in a back street within the coastal town of Redhead, south of NSW’s Newcastle, has begun to punch well above its weight thanks to inventive design, a willingness to go the extra distance and, in the words of famed motor racer Peter Brock, “bite off more than you can chew and then chew like crazy”. And now they’ve upped the ante by landing their new 'mini hybrid': the Sherpa. 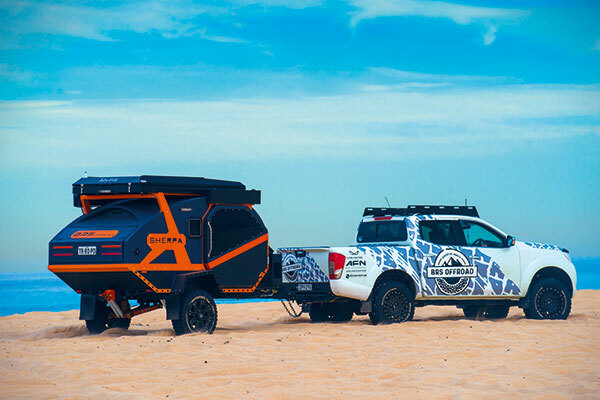 “When I first started planning the Pursuit, I thought that this was what I was designing,” said company owner Ben Souter, standing proudly alongside the first of the radical high-riding, bright, orange and black campers. “But that project kept growing as it evolved into a touring hybrid. The design parameters were for an offroad teardrop, that would be under 2.4 metres in height, so that it would fit into a domestic garage; would suit mum, dad and two kids; that would be light (under a tonne in tare weight); would be all-Australian in build and design, with a hard shell body that had minimal canvas; and would be super offroadable. The outcome is a case of the teardrop meets the 21st Century, using the very latest high tech solutions and materials in an attempt to bring the minimal canvas theme to a smaller package suitable to today’s market. A lot of the design features are typical of the teardrop heritage — the kitchen across the back under a lift-up door, the bed occupying the floor area inside, the body being blunter at the front and tapering down to the back — but that’s where it ends, and the space age execution attracts attention wherever it goes. 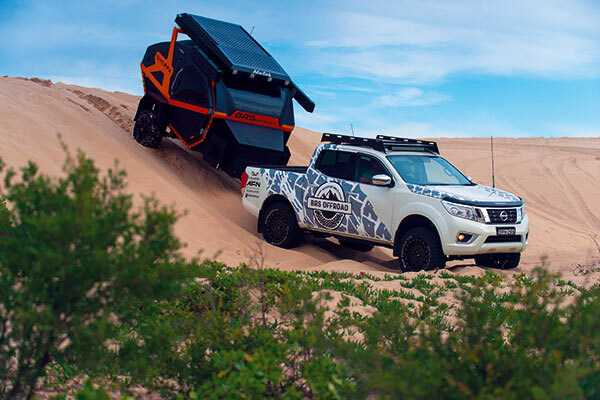 Ben, who had just returned from a four-week, 7000km test and development trip through the Flinders Ranges in South Oz with the prototype, said that it was at times impossible to get out of a fuel stop without having to answer twenty questions from an instant crowd of onlookers. Amongst the most attention grabbing features is the matte black and bright orange paint scheme — executed in Raptor Liner stone chip-resistant paint — which is non-negotiable. “This is a camper aimed firmly at a younger market than we’ve been seeing for the Pursuit, somewhere between 25 and maybe 55, so we wanted a presentation that would grab that market where they live,” Ben explained. So, has the BRS team hit its target marker points? Well, at 2400mm with the rooftop tent it’s right on 2.4 metres high. The suitability for a family of four is up to the market to determine, but the capacity is there for up to four people to have a comfortable bed and cooking facilities to suit. At 960kg tare with all the options we saw, it’s under a tonne in weight. It’s definitely all made in Australia, though a few of the bolt-on bits have been sourced from overseas (but isn’t that always the way?). There is a hard shell body and a minimum of canvas or similar materials to set up. And its high ground clearance, offroad suspension and amazing departure angle imply super offroadability. 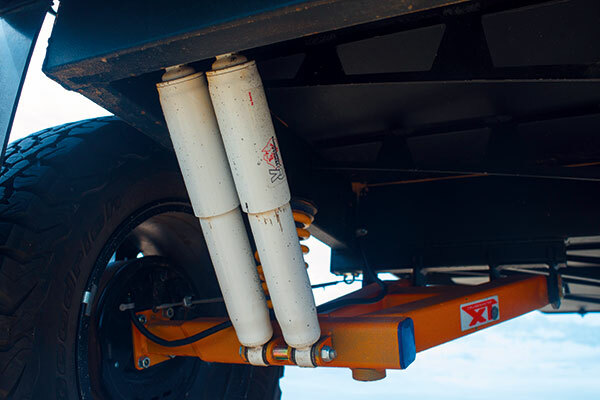 The whole camper begins with a radical chassis, built on what will be a hot dip galvanised single 150 x 100 x 4mm central beam that runs from the hitch to the back of the body, with two lateral wings. The front end looks remarkably similar to the drawbar on the Terra Trek camper as seen at Camper Trailer of the Year. Ben, who was present with his Pursuit, tells us he was deep into building the Sherpa at the time and couldn’t believe the similarities, and was concerned over accusations of stealing ideas but says that there are few alternatives in execution if you’re going with such an idea. Our review camper was the prototype, and since it potentially might have required modification or additions, it was not galvanised to permit welding and changes. The body, manufactured in a two-piece process, similar to the Pursuit, has a built-in monocoque rigidity with a series of lateral aluminium ribs under the floor, and sits saddle-like, on the central beam. This goes a long way towards meeting that under-1000kg tare target. The body, from the floor up to the central girding orange strap is 5083 marine grade aluminium in two 3mm layers with an air gap between for insulation, with a total thickness of 25mm. Above, the top of the body is a one-piece 20mm thick honeycomb centre with a fibreglass skin on either side. It’s lighter and stronger than the high density foam in the walls of the Pursuit’s top but not as good an insulator. The whole one-piece upper body weighs in at just 50kg, and the two huge side doors are made from the same cellular material. 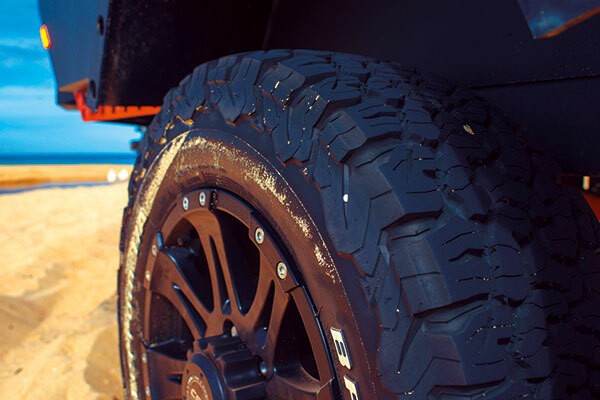 The whole package rides on a Cruisemaster XT suspension designed to suit a 1600kg maximum package, with dual shocks, 10in electric drum brakes and BF Goodrich all-terrains on 17 x 8 Raptor rims. At the front the hitch is the now almost universal DO-35 but won’t be stressed by the 90kg ballweight, while at the back is a tough looking central tow point. Helping with the weight issue was the use of plexiglass in the windows, as well as a minimum of slides in the camper, which assists in keeping costs down and reducing the number of items which need to be maintained or which can break. So much for the basic structure, but what about the details? 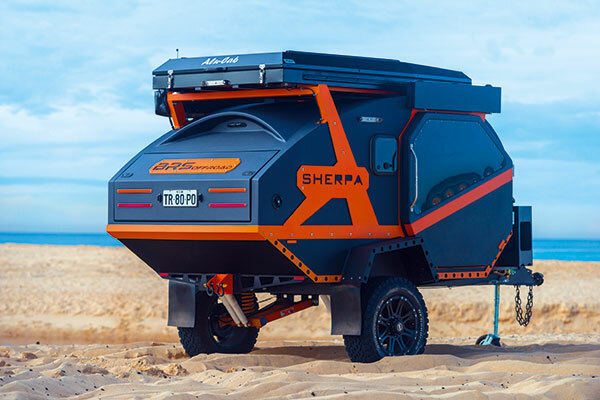 The Sherpa can be set up to accommodate two or up to four. 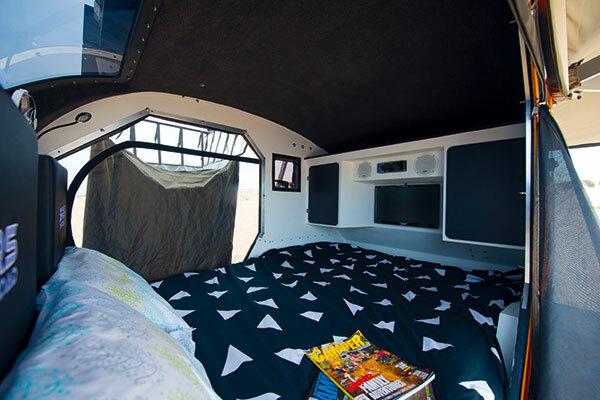 The main sleeping quarters, as with all teardrop designs, is with a mattress on the interior floor. This is on a 150mm queen-sized foam mattress, with the head to the front wall and the feet towards the back. Above the feet are two cupboards, a Fusion ms AV755 DVD/CD player and speakers and a 21in LED/LCD combo TV, with additional storage on an open shelf above. In the ceiling above the sleepers’ heads is a “moon gazer” window, as well as the front and two heavily tinted side windows and two swing-out marine side windows which are dust and water sealed but can be opened for cross-ventilation. The bed head is made from two well-padded removable panels behind which was additional storage and in the centre was a main control panel, with an outlet for the Dometic diesel hot water/space heater, the thermostat, light switches and double 4.8 amp USB and cigarette plug outlets. On either side were reading lights and two Sirocco fans. The Sherpa, like the Pursuit, has auto lights and locking, via a remote key, but can be opened manually. Access to the interior is aided by a manual fold-out step ladder. At the front was an upper storage box containing the Eberspacher diesel hot water/space heater system and fuel tank, Enerdrive 40-amp DC-DC charger, 20-amp Enerdrive mains charger and 125Ah Enerdrive B-Tec lithium battery with its own internal battery management system and smart phone monitoring. Under the main front storage box is a locker for the spare wheel, ramps and wheel chocks. Either side of these boxes are two jerry can holders. Water travels in a 200L bladder in a closed void just above and behind the suspension. This makes for a simple solution about mounting but prevents the fitting of a standard water gauge, though a Topargee gauge which monitors water flow through an in-line impeller would do the job nicely. The kitchen was another matter in our review camper. As stated, this was the prototype, and the execution of some of its planned features was not complete when we saw it. However, things move fast in the world of BRS and two days later we received a video of a much improved and updated kitchen. Like all teardrops, it is located across the back of the camper, beneath a tilt-up hatch. It has two 30L Dometic drawer fridges, one on each side, with a two-burner metho cooker on the bottom of the central space, and with a slide-out storage box above. The original design had the box as hand removable but it now comes out and drops into reach on a drop-down slide. Above and at the back was another kitchen-wide tray that is ultimately designed to swing down at an angle on a couple of arms. As a straight reach, vertically challenged people might find this difficult to access but BRS plans a lever system that will be located low down and at one side of the kitchen. A fold-down rear lip serves as bench space. Water is accessed via a hose from a mixer tap with hand control nozzle that tucks down the passenger side of the kitchen and which might also be handy for washing off feet after a day on the beach. The version we saw had it extending round to the passenger side where a sink and a small work bench attach to the side of the camper. In the revised format a small slide extends out under the fold-down bench with a pop-down silicon sink. Above the side and back of the camper is a swing-out Shadow radial awning. These are a South African product, built with sturdy aluminium arms designed to withstand strong winds. It’s equipped with one drop down leg for the central rib for breezy conditions but otherwise is self supporting. The aluminised cloth between the ribs gives cool shade. The process of deploying this awning takes less than a minute. Walls would be a highly desirable addition in windy conditions and are available but are reportedly expensive, so BRS is looking into providing its own version at a much cheaper price. An optional extra that looked very useful was a Quick Pitch ensuite above the driver’s side door. 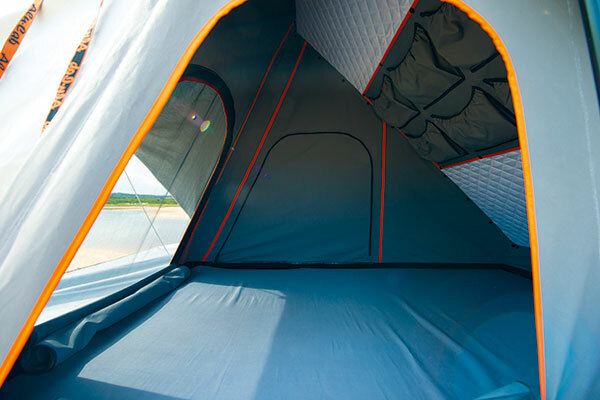 This folds out for use in about 10 seconds and provides a virtually instant shower or change room that is readily accessible from the camper interior via the open doorway or can be accessed from outside. 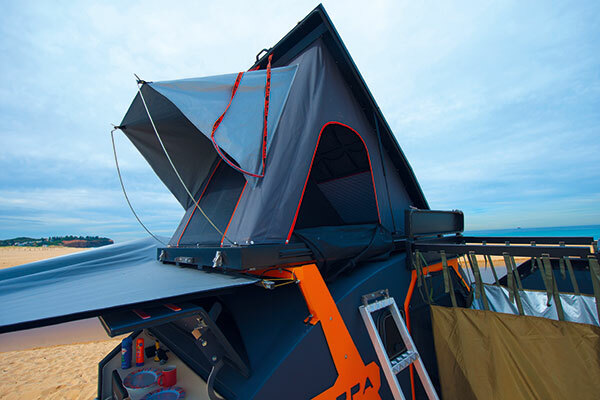 This is a neat product that gives a ready 900 x 900mm room, but it is open to the elements above and would open that side of the camper to the weather when in use. The shower attaches to an outlet in the front box adjacent to the water heater. 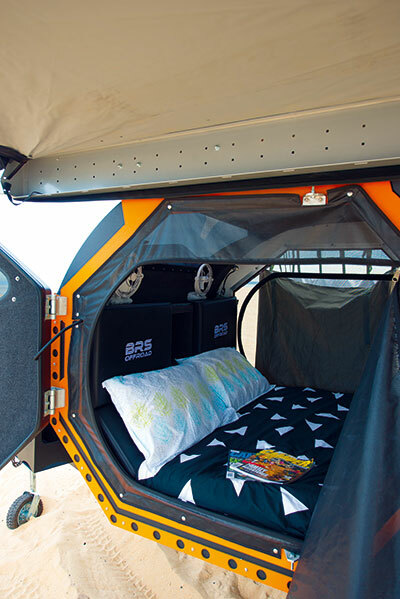 As for sleeping quarters for two more people, the Sherpa can be fitted with an optional ($4700) rooftop tent. The Alu-Cab unit has a tilt-up top, fly screens, foam mattress, three good sized windows and provides rapid accommodation, though access is via a six-rung ladder that has to travel on the interior bed, though again, BRS is working on a fold-up and more compact design. Many adults have reservations about rooftop tents for obvious reasons but kids usually find them something of an adventure. 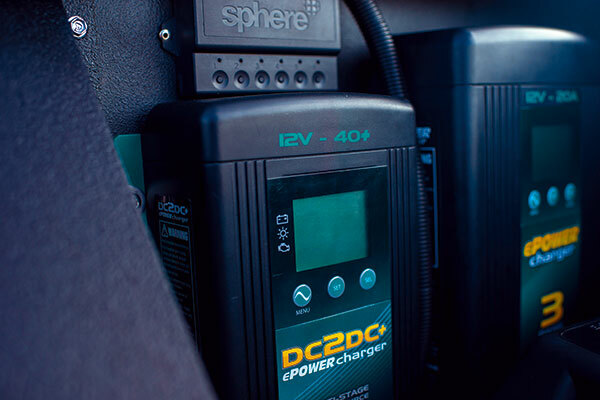 Either on the roof of the rooftop tent or the camper, is 200 watts of 24-volt Enerdrive monocrystaline solar to keep the battery topped up. At 24 volts it has much longer peak solar hours than the more usual 17-18 volt designs so does a better job of replacing consumed power. It will be noted that there is a small “wing” across the back of the camper, above the kitchen. This adds additional storage space inside, by raising the roof, and shelters a rear vision camera beneath to assist with reversing or keeping tab on the large truck on your tail while hauling up the expressway. All this looks very exciting, but are there any shortcomings? Well, yes, but as we have noted, we were looking at the prototype, and thus our scores were lower than they might otherwise be, yet we saw how quickly something like the kitchen could be radically worked over. And to offset those limitations you need to note you get an absolutely go-anywhere lightweight camper, with very rapid set-up (all under 10 minutes) and a high standard of engineering and fitout. The awning becomes a vital part of the living space since there is very limited internal space. For inclement weather you are going to need those walls and that needs to be resolved, as does the hole above the pivot point of the awning, which is above one corner of the kitchen. In heavy rain, the slope of the awning material would direct plenty of water there which might become a problem in bad weather. The side guards, which were on an inexplicable angle, could easily be useable as external work or storage space so would benefit from a redesign. There is no stone guard, and despite the Raptor coating on the front there were still accumulated marks after the camper’s recent Flinders trip, and exposed vertical surfaces on the jerry can holders, in front of the doors and across the front of the two front boxes either need to be coated with a rubberised surface or finished in aluminium chequerplate. The ladder access to the rooftop tent seemed a little sketchy to me, but then, I’m over 60. However, it could be made a little more reliable with a little work. Storage is limited, and chairs, table and other larger gear would either need to be carried on the bed (and then they have to go somewhere when camped in bad weather, or travel in the car. Even then, the storage isn’t great and for those addicted to carrying a lot of “stuff”, you might find you need to carry a bit in the car. Still, we’ve seen other camper prototypes which had a lot more to set right. And the Sherpa has a lot going for it. Its high tech approach to construction and distinctive design makes it pretty unique in the camper world and gets the long favoured teardrop concept out of the plywood and ball-hitch groove and into the tough offroad category. Who knows, maybe this is going to open a whole new genre of camper. At $64,000, as we saw it, it’s not inexpensive, but this level of tech never is and for those looking for a small hybrid with big potential ought to be taking a look at the Sherpa. The base price without the optional rooftop tent and with two 120Ah AGM batteries instead of the lithium battery is $58,700. With BRS recently adding outlets in Perth, Adelaide, Melbourne and Sydney they are flat out meeting the demands of the market, so are not making these available until September, but after that, watch out.